Blog: What is a Navigation Officer? 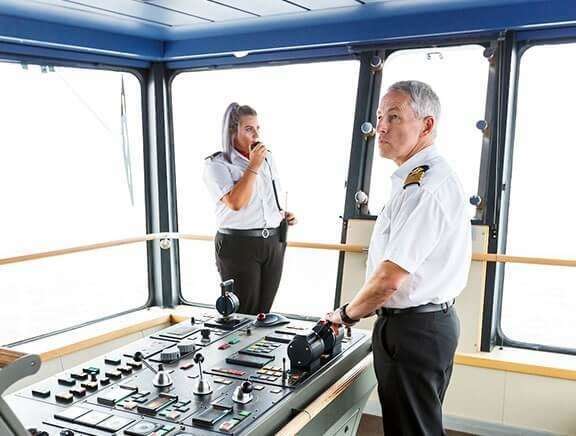 A navigation officer, also known as a deck officer, is a vital member of the ship’s onboard management team ensuring the safety of the crew, cargo, passengers and vessel both at sea and at port. It’s a big responsibility. This is an exciting role where no two days are the same. The navigation officer makes important decisions on the navigation, communications, crew, cargo and overall running of the ship. As well as the management side of things they also carry out the day to day deck operations and general maintenance duties. Captain (Master) – overall charge of the day to day running of the ship and the safety of the crew, cargo and passengers. The captain also takes care of all legal and commercial matters. Chief Officer – responsible for the management of the deck operations and maintenance, cargo handling and storage and watchkeeping duties. Second Officer – responsible for voyage planning using and carrying out watchkeeping duties. Third Officer – responsible for the maintenance of life saving equipment and firefighting appliances. They also assist the second officer and carry out watchkeeping duties. The Merchant Navy offers clear career progression where one day you could become the captain of your own ship. Many officers remain at sea for their entire career but if you wanted to you could move into an onshore position and even consider a career in the wider industry. If you are a born leader who loves a challenge a career as a navigation officer could be for you. You’ll be working with cutting-edge technology and leading teams of people. It’s a big responsibility from an early age. The starting salary once qualified is around £20,000 and there are a number of benefits such as free food and accommodation while at sea, generous holiday allowances and the chance to see the world. So what are you waiting for? Start your journey today.